An ‘advance uncorrected page proof’ of Nudge I managed to get off Abebooks. Thanks to Hien Nguyen for the photo. 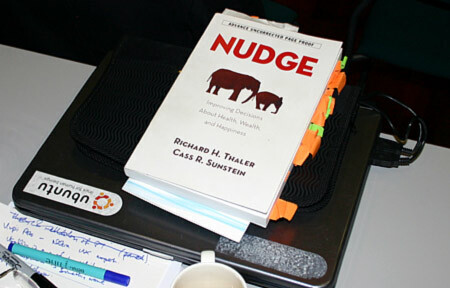 Nudge, by Richard Thaler and Cass Sunstein, is a publishing sensation of the moment, no doubt helped by Thaler’s work advising Barack Obama (many thanks to Johan Strandell for originally pointing me in Thaler and Sunstein’s direction). I’ve been reading the book in some detail over the last month or so, and while a full section-by-section review of its implications/applicability to ‘Design with Intent’ is in the works, this morning I saw that the Nudge blog’s John Balz had linked here with a post about the Oxford benches, so it seemed apposite to talk about it briefly. Behavioural economics has/ought to have a lot of parallels with design psychology and usability research: it is effectively looking at how people’s cognitive biases actually cause them to understand, interpret and use economic systems, not necessarily in line with the intentions of the systems’ designers, and not necessarily in accordance with rational man theory. It’s clear there’s a lot in common with examining how people actually understand and use technology and designed elements of the world around them, and there would seem to be a continual bottom-up and top-down iteration of understanding as the field develops: what users actually do is studied, then inferences are made about the thought processes that lead to that behaviour, then the experiment/system/whatever is refined to take into account those thought processes, and what users actually do is then tested again, and so on. This is very much the way that many conscientious user-focused design consultancies work, in fact, often using ethnography and in-context user observation to determine what’s really going on in users’ heads and their interactions with technology. Dan Ariely‘s Predictably Irrational is an excellent recent book which lays bare many of the cognitive biases and heuristics guiding everyday human decision-making, and he does take the step of suggesting a number of extremely interesting ‘improvements’ to systems which would enable them to match the way people really make decisions – which are, effectively, examples of Design with Intent as I’d define it. But Thaler and Sunstein go further: Nudge is pretty much an elaborated series of applying techniques derived from understanding these biases to various social and economic ‘problems’, and discussion of how guiding (nudging) people towards ‘better’ choices could have a great impact overall without restricting individual freedom to make different choices. They call it libertarian paternalism and in itself the idea is not without controversy, at least when presented politically, even if it seems intuitively to be very much a part of everyday life already: when we ask someone, anyone, for advice, we are asking to have our decision guided. BJ Fogg might call it as tunnelling; Seth Godin might express it in terms of permission marketing. For Thaler and Sunstein, choice architecture is the key: the way that sets of choices are designed, and the way that they are presented to people(/users) is the basis of shaping decisions. (There’s a massive parallel here with designing affordances and perceived affordances into systems, which isn’t difficult to draw.) The establishment of ‘choice architects’, as Thaler and Sunstein describe them, within companies and governments – people with specialised domain knowledge, but also understanding of biases, heuristics and how they affect their customers’ decisions, and how to frame the choices in the ‘right’ way – is an intriguing suggestion. Clearly, any system which intentionally presents a limited number of choices is in danger of creating false dichotomies and decoy effects – either accidentally or deliberately (e.g. this [PDF, 300 kB]). Manipulation of defaults raises similar questions (Rajiv Shah is doing some great work in this area). But, depending on the degree of ‘paternalism’ (or coercion) intended, it may be that intentionally misleading choice architecture might be considered ‘ethical’ under some circumstances. Who knows? We’ll look at Nudge in more detail in a future post, but suffice to say: it is a very interesting book – my copy’s annotated with over a hundred torn-up bits of Post-It note at present – and it seems to be placing designers, of various kinds, at the centre of taking these ideas further for social benefit. It was great to see you at Persuasive Technology 2008 in Finland. You did an impressive job there. Keep up the great work. Dan, thanks for this helpful and thoughtful review. I’m just thinking about how all this: Persuasion Technologies/Architectures, Jared Spool’s Seductive Design, HFI’s Persuasion Emotion and Trust, and Don Norman visceral-behavioural-reflection … stuff can be brought together in a consultancy setting to help commercial and public sector sites achieve their goals, over and above being usable. PS: The Oxford Street sloping bench made me laugh out loud.